Every few weeks, we order Thai delivery from Tom Yum Koong in Medford. It’s pretty standard Thai fare, but we continue to order from them because they are consistent with their food and have pretty good vegan options. Plus they are really nice! Ending dinner with their Fried Banana Dessert, topped with a little raw agave nectar and some coarse sea salt, is the best. Their dessert inspired me to recreate a fried banana dish of my own, featuring a sweet (agave), salty (miso) and rich (cashew) component—which all worked well together to make this easy and kind of fancypants dessert. Make the cashew miso cream by mixing together the first three ingredients. Set aside. Heat the oil (enough to submerge the bananas in) in a saucepan over medium-high heat for about 4 minutes. Test the readiness of the oil by dropping a pinch of the cornstarch into the oil—if it sizzles immediately, you are ready to fry. Working in batches, dip the bananas into the Ener-G slurry and then coat with the cornstarch, tapping off any excess. Slide them into the oil slowly (being careful not to overcrowd) and fry until golden, about 2-3 minutes. Remove from the oil and place on paper towels to drain. To serve, drizzle with the agave and a spoonful of the cashew miso cream. Sprinkle with sesame seeds. Those friend bananas with miso are intriguing. I have to try them. Thanks Joanna — agave and miso are surprisingly tasty together! 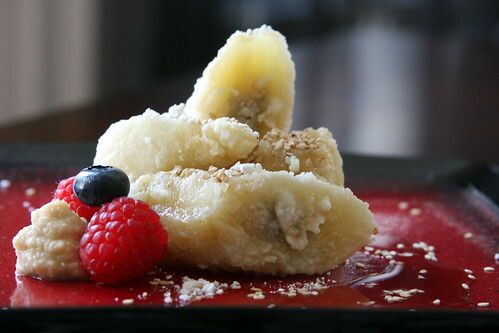 I love fried bananas and love the idea of adding a saltiness too. I'm intrigued! I love everything banana, chocolate covered bananas, smoothies with banana and especially fried bananas. Have you ever tried fried eggroll bananas? Thanks for posting! I love fried bananas!! mmmm mmm mmmm. I’m assuming my bananas were too ripe, as they “leaked water” inside the fried casing, and they were far too sweet. I didn’t need the coconut nectar (subbed for agave), although the swirl sure looked nice on my plate. My cashew miso was also too salty, as I’m new to miso and had/used yellow instead of white. Even with all that… this was a tasty melding of flavors and textures. (LOVED the chewy, crispy casing of the bananas. I used potato and tapioca starches instead of cornstarch.) Would definitely make this again, although with greenish bananas and half as much miso, since I’m using yellow. That ‘nana was nicely and surprisingly light when it was done, and went way too fast! A cool, light finish to our chickpea night (lol), whereupon I’d made the buffalo tacos.